You Wanna Do What to My Memetastic Award? Yup, you heard me right. 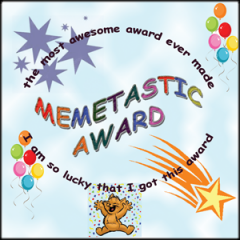 Memetastic Award! And I got one. No, it doesn’t hurt…it’s a fun thing, a blog award and dear Dorky Deb passed it on to me and four other recipients, having received one herself previously. Is there a catch? Not as far as I know, except…well I gotta set out five facts about myself…oh wait, four lies and one fact, and you gotta guess which one is the truth. I’ll warn you in advance that I have led a pretty…uh…exuberant life. Okay, weird life. And any one of the little gems could be true, but only one is…you guess which one. Ready? 1. My mother was a talented and acclaimed radio actress and played in radio dramas in the late 1940s. My father wrote the plays and produced them. I once got to scream in a WWII radio drama and then was shot while being held in my mother’s arms. The scream scared me more than the shot did. 2. My brother was good at horse riding and showed me how to ride when I was 6 or 7. He was training me to ride in the junior division of The Royal Winter Fair in Toronto. However, the horse I was training with, named Gypsy, bucked me off, I got scared, and didn’t get my nerve back until after the Fair was over. I never tried riding at the Winter Fair again. 3. My grandfather, a government surveyor, was surveying the boundary between northern Alberta and southern Northwest Territories in the early 1900s, when he was captured by aboriginals disgruntled by various Indian Treaties. They told him the government lied and they would kill him if he didn’t change the treaties. He did some fancy talking to convince them that he was a government surveyor, not a treaty agent. They eventually, reluctantly, let him go. He used to tell me the story as I sat on his knee. I didn’t really believe him until he showed me the faded newspaper clipping he kept in his desk drawer with a bunch of other memorabilia. 4. How fleeting is youth! When I was in my early 20s, I won a small beauty contest in Montreal…Miss NDG (Notre Dame de Grace), a municipal English district in Montreal. I let it go to my head, thinking maybe I could reach the heights of Miss Canada and then maybe even Miss Universe. Far from disliking the whole world of beauty shows, I loved it…the excitement, glamor, attention. I seemed to get along well with the other girls, which made a difference too. Anyhow, the next division was Miss Montreal…and I lost miserably to a lovely French girl. I later admitted that she was prettier than me. A lot prettier. I didn’t even get Miss Congeniality…they didn’t have that award in the Miss Montreal contest. 5. Motherhood agreed with me. Every time I got pregnant, I seemed to glow…never got morning sickness and seemed to be spared the more common aches and pains in the 7th, 8th and 9th months. My first child was born quickly, although I went through some pretty excruciating labor pains, but only for 7 years. During the 2nd and 3rd pregnancies, I practiced self-hypnosis, and honestly, I’ve had worse gas pains when it came time for labor. However, something went wrong with my innards, and the 4th and 5th babies were delivered by Caesarean. I couldn’t have any more babies after that. All five were healthy and normal. Now for the rules for the five new winners of the Memetastic Blogging Award that I will choose shortly. P.S. If you want to add yourself to the Memetastic Award winners list, here is the Memetastic Hop page. This entry was posted in General, Non-writing posts and tagged Blog award, memetastic award, postaweek2011. Bookmark the permalink. One fact I know about you let me pick out the lie…I won’t give it away, though. What IS interesting is all the other stuff! I had no idea 🙂 Your life (and your family’s) is positively rife with exciting stories! Ack, no no Steph, only ONE of these things is true…all the others are lies. And for someone who knows me, most of it is easy to pick out, but if you don’t know me, it will be hard to pick the ONE truth amongst the FOUR lies. Ah. I can only weed the one out then, darnit. I’ll go with either 3 or 5 is true! Bizarrely, I’m leaning more toward 3. It’s just…too strange to be made up. (Unless perhaps you’re referencing an actual person & making up that he’s a relation…hmm). I’ll say #2 is true. I will guess…. #1 as the truthful one. Yeah, I did have a lot of fun writing them, although I almost got carried away in a couple of cases and started to write a story 😛 I will reveal which one is correct this weekend, either Saturday or more likely Sunday to give people more time to guess. Heh, thanks for guessing everyone (*pats Steph on the back* It’s oKAY, Stephanie. We all have days like that). I post the correct answer and some comments about the other incorrect ones this weekend. Thanks also for nominating me…this was indeed great fun! You were an obvious choice, Hobbit Queen, so you’re very welcome. However, I am confused about which number you picked to be true. Thank you for giving me this award, Sandra! I pick #3 as your truth. (At least I hope it is true so I can know more of the story.) This was lots of fun. You are a great storyteller which made picking difficult. My lies/truth goes up tomorrow. Pingback: The Truth About Sandra – Memetastically Speaking | Wizards and Ogres and Elves…oh my! Finally, Sandra, I have posted and passed along the Memetastic Award you so generously bestowed on my blog. Thank you again for that! I mention you and link to your blog in the post. I hope you’ll “play,” and guess which story about me is true. Hope you are well.